Retrospective exhibitions are not very often held in Uganda. There are two main reasons; firstly, most artists sell to the expatriate community and tourists who pack their treasures and return home. Secondly, Nommo Gallery – the national gallery – has no policy, later on the money to collect from artists. 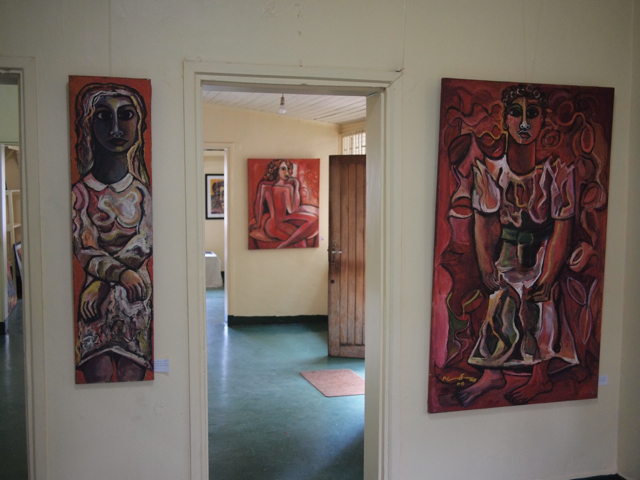 Mukasa’s retrospective exhibition has been possible because, as a painter, he was extremely industrious and for him art was his life – his oxygen as one of the contemporary Ugandan singers recently put it. He had a large collection of paintings and drawings in storage at home. But more importantly, Mukasa appealed not only to the external market, but also to the local emerging clientele. Some of the work on this recent show “In Memory of Geoffrey Mukasa” (November 2011) at the AKA Gallery (formerly Tulifanya Gallery) was on loan from his local collectors. 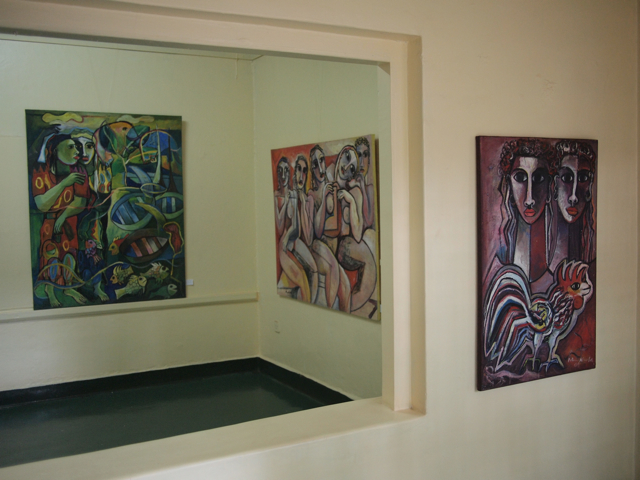 The gallery, which has been the trusted exhibition space for Mukasa for over a decade, has been vigilant in ensuring that his legacy lives on. 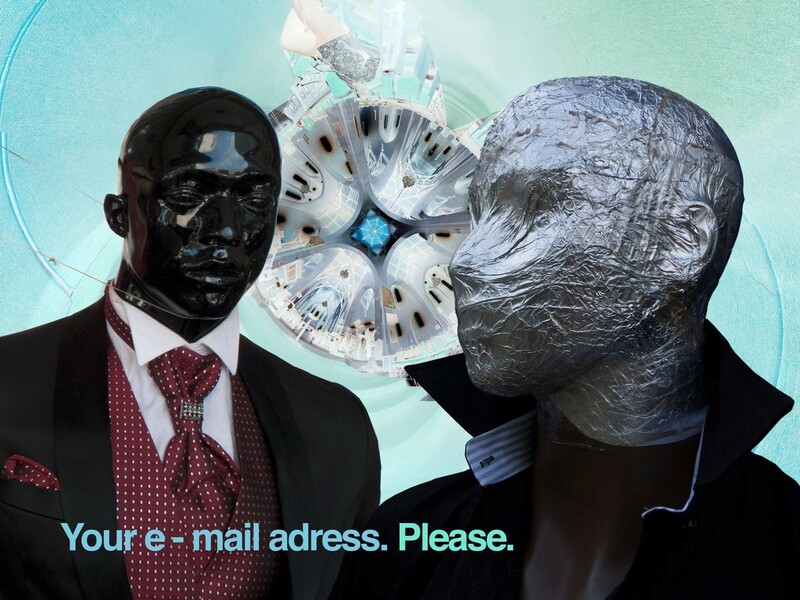 This exhibition is a step in that direction. From the Geoffrey Mukasa-exhibition at AKA Gallery, Kampala, 2011. Mukasa graduated in painting from Lucknow College of Arts and Crafts, India in 1989. Both India and Uganda were former British colonies. However, while India regained her independence in 1947 after over 200 years of colonial occupation, Uganda was “protected” for just over 60 years and became a nation state in 1962. The period of revivalism (renewal of past traditions in the context of modern developments) which swept across India at the turn of the 20th century are just beginning to take roots in Uganda. When the Kiira electric car was launched in November 2011, President Museveni said that Makerere is now waking up from a deep slumber and has started to address the realities of the time. Mukasa was therefore lucky to be in India at a time when experimentation in formal content and subject matter had matured and was a commonplace discussion both in art colleges and among the Indian artists fraternity. Judging from the boldness and restlessness of the paintings in this exhibition, Mukasa must have actively participated in these debates. It is clear that India made a strong impression on him. Consequently, the attitude to art making and visual impressions he returned with made his work rather odd among the local audience, as we shall discover shortly. It is noteworthy that Uganda – where Mukasa grew up and had his primary and secondary education – did not inherit a rich legacy of this kind of art. Instead, decorative art, basketry, myths and legends abounded. The West, which until recently has controlled scholarship in African art, did not highly regard these products. In addition, the school syllabus for art in Uganda – that had prepared Mukasa for university education – described baskets and mats as mere crafts. It is the principles and elements of art in painting, sculpture, ceramics and graphics that up to now continue to form the key features of art education and production in Uganda. Therefore, Mukasa had to undergo major ideological shifts in India to be current. Upon his return to Uganda Mukasa was enrolled in Uganda Television as a graphic designer, which at the time was equipped with rudimentary technology. UTV did not give the young and energetic Mukasa the outlet for his artistic energy. Alongside his TV assignments, Mukasa painted at home. His debut on the gallery scene was a joint exhibition with the late Fabian Mpagi at the newly refurbished Sheraton Hotel in 1990. The two exhibited totally different approaches to art. Mpagi represented a typical Makerere Art School style, where the technical handling of materials, anatomy and color theory were highly valued. Not that these were not important, but they seemed to overshadow the artistry bit. Mpagi had in any case been a student/lecturer at Makerere, who during the 70s pursued a masters program, but dropped out because of the persistent internal wrangling at the time. Mukasa’s paintings on the other hand were less polished. They retained a certain kind of rustic and raw energy that indeed echoed the difficulties of the post civil war period. The luminous paintings, radiant with saturated colors that he applied with ease and confidence, reminded us that we live in the tropics and moreover along the equator. But in these colors, we also experience a sense of resilience and hope, something that Ugandans desperately needed to hear and be told again and again. Further still, these loud colors gave the paintings a strong presence and power. Mukasa chose to violate the laws of perspective, as these could have compromised his capacity for emphasis. He reassessed anatomy in plants, animals and human figures in an eccentric way that returns us to the ‘classical’ African carvings. Given that his African tradition lacked figurative representations, and moreover he had been dimly exposed to them at home, it is reasonable to say that Mukasa may have succumbed to the expectations of India, of what a modern African artists ought to paint like: Neo-traditional African art. Carved masks and figures were in India perceived as the principal hallmarks of African art. A mistaken belief – probably inherited from the former colonial masters. Several artists working along similar lines like Francis Nnaggenda have argued that the absence of the figure in the traditional art of East Africa does not suggest that the spectacular carvings from west and central Africa are not part of our inherence. Indeed our claim to it is legitimate. Yet interestingly, it is the case that Mukasa’s single and most important influence for his paintings was not the classical African sculpture, but rather a well-known Indian painter, M.F. Husain, who flowered in the late 40s. During this time, a Progressive Artists Group was formed and through it, Husain was exposed to, and strongly influenced by the work of Emil Nolde and Oskar Kokoschka. These had themselves seen the art of Africa and Oceania on postcards or ethnographic museums in Europe. So it is possible that Mukasa was triggered to respond to his African sensibilities through a secondary source. In other words, Mukasa discovered Africa from an Indian in India. Since that famous and perhaps launching joint exhibition, Mukasa never looked back. He left his job at the Uganda Television to concentrate on art. The surroundings at Munyonyo, where he lived since the early 1990s, has only recently become as affluent. Munyonyo was semi-urban but with all the trappings of a village life. Mukasa did not have to go far to find his favorite subjects rooted in social life and culture. The chicken that freely forage in the backyard are frequently depicted in his paintings. The fish at the nearby landing site are also a common sight. Fruits and vegetables are grown and vended in this area throughout the year. But these are more than food items. They play a major part in the ancestral worship and other activities of cultural significance. And culture has seen a resurgence in the recent past, particularly after the restoration of the monarchies in the 90s. To amplify their presence and significance, these objects are schematized. The reclining, sitting and standing figures dominate Mukasa’s tightly packed canvases. Their heads are composed in a frontal posture and they often sit incongruously on their supporting bodies, while their faces wear a solemn and yet pleasant gaze. With their gesturing hands displayed at the front of their bodies, these figures remind us of the early 20th century African photography. Subjects being photographed always insisted on showing the full presence of their hands lest they would be mistaken for lepers. The hands on Mukasa’s figures, however, are active and primarily used as devices to balance the composition. It is easy to assume that Mukasa was a returning refugee, given that many artists in exile returned during the same time – late 80s. Mukasa and the returnees however had one thing in common, they were exposed to new possibilities in art albeit in differing circumstances, which they shared with the home bound artists. They experimented with all sorts of conceivable materials in their surroundings and made “new” art. In Mukasa’s paintings for example, old newspapers were given a new identity once they were pasted on the canvas. With such mosaic innovations, Mukasa confirmed that materials for art need not be expensive. What is more, the reclaimed materials were recognizable and familiar to his local audience, which made Mukasa’s art emblematic and accessible to the ordinary Ugandans. As an artist Mukasa was never afraid to take on new challenges; he taught us to be bold and courageous. He straddled the past and the present and his contribution to the young subject of contemporary art in Uganda has been immense. Mukasa stretched the borders of painting beyond the expected, and deservedly; today he is celebrated as a leading Ugandan painter of the 20th century who was key in raising the profile of art in Uganda. Mukasa’s legacy will continue to reverberate across the country and beyond for many years to come. Dr George Kyeyune is an associate professor at Makerere University art school and definitely Uganda’s leading expressionist, who has helped many local artists and viewers find themselves in his simple narratives about urban life in Kampala. This is a wonderful start to 2012. Things are beginning to put themselves in order and all that was needed was a few people to put their hands in pockets and pull out some notes…rather change! Thanks guys keep it coming..it is beginning to look like it maybe worth being an artist in Uganda after all! Startjournal wants to hear from its readers: What do you think is the legacy of Geoffrey Mukasa? How has he influenced you as an artist?